This is our second day with Daniel and our second 5-star experience. Daniel was prompt, professional, informative, personable, and flexible. He was waiting for us when we came down at the appointed time in the morning; he pointed out landmarks as we were proceeding to the wonderful Aquilla Reserve; he shared some of his pertinent life experiences as we were riding with him; and upon asking him for advise on where we might acquire some chocolate for a friend at home, we went to a choc factory. TOUR GUIDE RESPONSE: Thanks Tom. I had a great time with you guys. I trust that Jeanne and you will really enjoy Chobe and Vic Falls, and the cruise after that. Daniel was on time and on point from the start. He was thorough in his knowledge and true to the posted itinerary. He was patient with any disabilities that we had with the venues visited and flexible when necessary. If he was responsible for the weather--it was perfect--I would nominate him for guide-of-the-year. TOUR GUIDE RESPONSE: Thanks Tom. You might just be exaggerating slightly - except maybe for my part in the weather!! This was a customized tour that fully met our expectations in a restricted time period. We would not hestitate to recommend this tour and guide. Thank you for an excellent experience. TOUR GUIDE RESPONSE: Thanks Cath, I appreciate it. My husband and I had a delightful 2 day City and Peninsular tour with Daniel during our recent stay in Cape Town, SA. As promised, he was flexible, knowledgable and very punctual. What made the experience outstanding was his willingness to provide his insights and opinions to our barrage of questions regarding not only the details and history of what we were seeing but about life, culture, and opportunities in Cape Town. TOUR GUIDE RESPONSE: Thanks Pat. I really appreciate the kind review. It was an absolute pleasure to have Larry and you here as guests in my little piece of Paradise! We booked a Private Wine Tour with Daniel. We wanted to see the area without the wine tasting, and Daniel was able to customize the tour to suit our needs. Lunch was in Franschhoek at the station which has been turned into a pub and grill. Sitting at a table on the tracks and looking at all the old station memorabilia makes this a very interesting lunch stop. Daniel is very personable and knowledgeable which added to our enjoyment of the beautiful scenery. I highly recommend taking a tour with him. TOUR GUIDE RESPONSE: Hello Janet & Bob, thanks so much for taking the time to submit a review, and for the kind words. I bet you are already missing our summer! We cannot say enough about our 3 Day Cape Highlights tour. Daniel personalized our tour to the nth degree for us and our 13-year-old granddaughter. At our request he arranged for visits to a cancer center and a primary school so that we could drop off our donations. He kept apprised of the weather and the crowds in order to optimize our experience. His enthusiasm never wavered. It was like being shown around by your favorite family member who wanted everything to be just perfect. We recommend him highly. TOUR GUIDE RESPONSE: Thanks Ken. Having you, Kathy and Kalee here was like showing family around! Hope you enjoy the rest of your trip and that the Africa bug has bitten you! Once it has bitten, you will be back!! Pick up was right on time, very informative and courteous. Would recommend. TOUR GUIDE RESPONSE: Thanks Gary. I appreciate it. Daniel is very knowledgeable and friendly. We enjoyed the entire tour - great local insights. Flexible with scheduling, accommodating our interests, and responsive. Overall, highly recommended. TOUR GUIDE RESPONSE: Thanks so much David for taking the time to submit a review, and for the very kind words! I really appreciate it. It was a pleasure to show Kevin and you around. Our tour was very comprehensive, Daniel is very knowledgeable and informative, he delivers information well. Daniel is obviously passionate about his country, and keen to ensure his tours are high quality. His vehicle is comfortable, and clean; Daniel is also punctual. He very kindly accompanied and waited for us whilst we shopped!! Would thoroughly recommend him. TOUR GUIDE RESPONSE: Hi Karina and Pauline, thank you so much for the kind words. I really appreciate it. I am so glad you enjoyed it and trust that you enjoyed your last “beach day”. Our guide was excellent at getting to point Agulhas. We traveled at our own pace and stopped where we wanted. On the way there we took a agriculture and scenic drive that was different from the Cape Town area. We arrived at Point Agulhas and he seemed happy to let us spend a long time viewing where the Indian and Atlantic Oceans meet. We than took a Beautiful drive Hugging the Sea with the mountains on the other side. He truly knows the ways to get there and back. Truly Excellent. TOUR GUIDE RESPONSE: Hi Tom and Mary, it was really a pleasure. Enjoyed talking to you which made the way just so much easier. I am glad you enjoyed it and that you took the time to write a review. I hope you enjoy your well deserved retirement! We enjoyed a first class informative and enjoyable day with our tour guide Daniel .This was our first time using Tours by locals and we would highly recommend them .We shall certainly use again . TOUR GUIDE RESPONSE: Thank you Graham. I am so glad I could be your first ToursByLocals experience! Daniel gave us a great all day tour. He is knowledgeable and personable and showed us way more than we could ever had discovered on our own. We highly recommend his tours! TOUR GUIDE RESPONSE: Thanks Jennifer. TOUR GUIDE RESPONSE: Thanks Martin. I hope that Janice and you have a smooth relocation and enjoy retirement! TOUR GUIDE RESPONSE: Thanks Michele. I really hope you and Paul will enjoy the rest of your time hete in “my paradise”! TOUR GUIDE RESPONSE: Thanks Emily. I appreciate it. TOUR GUIDE RESPONSE: Thanks Ken. Daniel was a delightful host. He was knowledgeable of the history, architecture, dining, and entertainment options for Cape Town and areas near by. He customized our tour itinerary to fit our interests on the spot! Recommend him highly!! TOUR GUIDE RESPONSE: Thanks Andy, and thanks for the snacks you left in my car! I enjoyed it watching rugby the next Saturday! You and Debbie were awesome guests. Daniel provided my wife and I with a great tour of Cape Town and the surrounding area. We were concluding a 12 day tour of Africa and decided to stay in Cape Town for a few extra days. Daniel customized a day long tour for us of sights we hadn't seen while in Cape Town. We saw the Castle of Good Hope, went up to Table Mountain, had lunch at a vineyard, and saw the Kirstenbosch Gardens followed by a drive along the coast. Daniel was very knowledgable and passionate about showing us Cape Town! TOUR GUIDE RESPONSE: Thanks Robb. I really appreciate it! Daniel was excellent and accommodated everything we wanted to do including Table Mountain. We did not, however, get to Robbens Island because of ferry schedules and weather. I would highly recommend him to anyone wanting to explore the city as well as the wine regions. TOUR GUIDE RESPONSE: Thanks Pat. I appreciate you taking the time to submit a review, and for the kind words. TOUR GUIDE RESPONSE: Thanks for taking the time to give feedback Sherry. I hope you and Jonathan will really enjoy the rest of your African adventure! Daniel is awesome! We loved our tour--he was very accommodating of our group which included four teenagers! He took us to all the places we wanted to see on the cape peninsula plus two wine tastings in Constantin. We highly recommend him! He was informative, friendly and fun to be around all day. TOUR GUIDE RESPONSE: Thanks Lora. I appreciate that you took the time and for the great review! 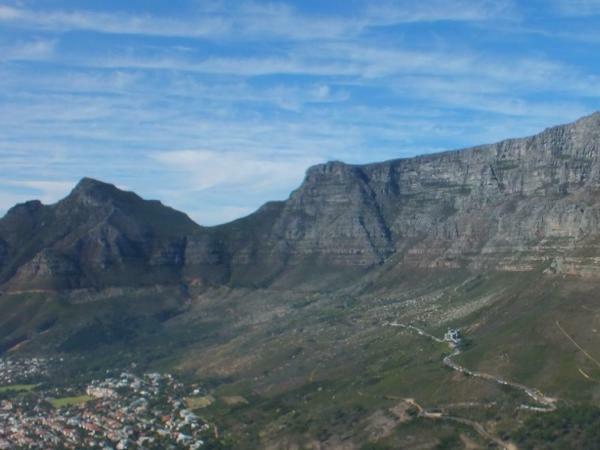 Just a pity Cape Town's weather would not allow us to do the Table Mountain hike as well, but a least that will give you something to come back for! Daniel was just great!! Knows Cape Town and surroundings to the perfection. Did the private wine tour, and designed the perfect route. Perfect!!! TOUR GUIDE RESPONSE: I really enjoyed my time with you and your family Alvaro. Thanks for taking the time to submit a review . I appreciate it. Daniel is a delightful gentleman. He modified the tour to not overlap with our later Tauck tour and did a beautiful job. He's very knowledgeable and has a great sense of humor. We had a terrific day. TOUR GUIDE RESPONSE: Thanks Catherine! It was a great day allround! You must really try to make it to the Great Food and Wine Show this weekend. I see Marco Pierre White will also be there, with many top South African chefs. This was our second day with Daniel. We understand that he is the only guide with this service that does this particular tour. Highly recommended. Great scenery. Since we had some substantial riding to do, we were able to talk about SA. His insights and opinions were enlightening and were among the highlights of our trip. First class guide. TOUR GUIDE RESPONSE: Thanks Herman. I appreciate that you took the time to review and for the kind words. Hope to see you and Debbie soon in my part of Paradise. Daniel picked us up from our downtown hotel and gave us a custom tour of the city. We had already seen quite a bit beforehand and he was quite flexible. There were some places we wanted to see and he had good suggestions as well. Very knowledgeable about the city and the history of SA. We enjoyed our time with him. TOUR GUIDE RESPONSE: Thanks for the kind words Herman. We really had to shift things around to accommodate Cape Town's infamous Southeaster, but in the end it all worked out! Glad you enjoyed it. We had a beautiful day for our long drive around the peninsula. The penguins performed on cue. Another tasty luncheon provided yet more local tastes and smells. Our guide had plenty of information available for us and was very receptive to all our requests and modifications to the tour. TOUR GUIDE RESPONSE: Thanks Leslie. I really appreciate that you took the time to submit a rating. We had a scenic drive around the Cape Town area including a wonderful lunch with many local dishes. Our guide provided us with a variety of vineyards, both large and small, but all of fine quality. TOUR GUIDE RESPONSE: Thanks for the kind words and the rating Leslie. Glad to see on Facebook that you have enjoyed the rest of your trip as well! My companion and I were with Daniel for two two days of touring. We consideri ourselves so fortunate to have had him as our guide in Cape Town. Daniel was very knowledgeable of the history of his country and all the sights he took us to. His professionalism was only surpassed by his extremely pleasant personality and omnipresent smile. Highly recommend him to anyone visiting Cape Town. TOUR GUIDE RESPONSE: Thanks Diane. I appreciate the kind words. I really hope that you and Barry have recovered enough to really enjoy your cruise and that you will always have great memories of our little piece of paradise at the bottom of Africa! Daniel, without question, is one of the finest tour guides we have ever used and we have traveled extensively and used Tours by Locals and other private guides quite a bit in the last five years. Daniel is extremely knowledgeable about South Africa and the Cape Town area and imparted that knowledge in such an enjoyable and interesting way. He simply made South Africa "come alive" for my husband and me!!! This particular day was spent touring the Cape of Good Hope and the Cape Peninsula!!! TOUR GUIDE RESPONSE: Thanks Mary. I appreciate the time you took to submit a review, and for the very kind words! Daniel is truly one of the best tour guides ever and we have used many, many Tours by Local and private guides in the last five years!!! This half-day tour of Cape Town was so wonderful. Not only did he show us incredible sights and view points, but he imparted substantial knowledge of South Africa from both a historical and modern-day perspective!!! One of the best guides ever--I recommend him highly!!! TOUR GUIDE RESPONSE: Thanks Mary. Travellers like you and Cliff makes my job such a pleasure! Amazing tour. Daniel was right at the airport, tickets in hand four our tour. He was very informative. We saw many things and were back in time for our flight. Thank you for an excellent layover. TOUR GUIDE RESPONSE: Thanks Tracey. We were really blessed with excellent weather - exactly what we needed to appreciate Table Mountain and Kirstenbosch! TOUR GUIDE RESPONSE: Thanks Jeanette. It was a great day - next time I will try to make sure it will be a bit warmer though! Daniel was so cooperative as we added a special stop that was not part of the original program. He was friendly and so informative and we felt very comfortable with him from the start. Would strongly recommend booking him on a trip to the Cape Town area. TOUR GUIDE RESPONSE: Thanks Sharon. Trust that you and Michael had a safe trip back. We had a wonderful day. Daniel is very knowledgeable, friendly and good fun. Many thanks for a great tour! TOUR GUIDE RESPONSE: Thanks Silvia, I am glad they enjoyed it. I agree - it was fun! TOUR GUIDE RESPONSE: Thanks Sanford. Daniel did a superb job. He drove us from the Table Bay Hotel to the game park and back. He gave a fascinating narrative. I had been to south Africa in 2008 and we discussed all of the interesting changes. charlotte and I were extremely tired and Daniel helped us everywhere. Charlotte couldn't walk very well and Daniel load the hotel's wheel chair into his trunk and made it easier for us to get around. Daniel took us shopping on the way back. Great guide. TOUR GUIDE RESPONSE: It was only a pleasure Gerry. I really hope you and Charlotte feel better after the night's rest and that you will have a great cruise to Accra! TOUR GUIDE RESPONSE: Thanks for the rating Rodger (Bobby?)!! I appreciate it! Daniel did a wonderful job - prompt, flexible, knowledgeable. We enjoyed the tour and the side trip to the penguins that he was able to make fit. He has interesting perspectives on life in South Africa and we learned a lot from him - what more could you ask for from a guide! TOUR GUIDE RESPONSE: Thanks Nate. I really enjoyed showing you and Linda around. This was a ten star not a five star trip, Daniel listened to what I wanted to do and really put great thought into what he suggested and as he learnt more about me put in little changes that he thought would make it more memorable. And as opportunities arose, he was able to be flexible around all these things. He knows his stuff, is a great driver - and deadly accurate with starlings! TOUR GUIDE RESPONSE: Thanks Neisha, I appreciate the kind words. I doubt if anyone who have not have lunch at the Two Oceans Restaurant will understand your starling comment though! Hope you have a safe flight home. We had a great day with a very knowledgeable and enthusiastic guide. Thanks to Daniel our visit gave us a lot of knowledge and understanding of the history and current affairs of Capetown as well as South Africa. We highly recommend the services of Daniel. TOUR GUIDE RESPONSE: Thanks Anders. I appreciate the feedback. Excellent tour. Car was clean and nice. Tour started right on time and in the location promised. Daniel is well informed and has excellent communication skills. He planned ahead and made proactive adjustments to the schedule that allowed us to miss some of the huge holiday lines and delays in the public parks. Well done- would use him again without hesitation. TOUR GUIDE RESPONSE: Thanks Jim. I really enjoyed showing the three of you around. Hope Zach are coming to grips with his "turtle coloring"! Daniel is personable, knowledgeable and very willing to accomadate requests. He is a find and if available, book him! TOUR GUIDE RESPONSE: Thanks Kevin. It was a pleasure to take you and Jan around! Daniel is a knowledgeable and wise person - sensitive to his city and its people. It was great to spend a day chatting with him, learning from him and experiencing Cape Town from an insider's view. TOUR GUIDE RESPONSE: Thanks Keith. I appreciate the kind words! TOUR GUIDE RESPONSE: Thanks Hyman. I appreciate the feedback. A super day that involved seeing interesting scenery and sights and doing wine tasting at a couple of good well established wineries and included a delicious lunch overlooking the vineyard. An excursion to be thoroughly recommended. TOUR GUIDE RESPONSE: Thanks Jill. I am glad you enjoyed it! The best tour guide we have ever had. Very informative. Great sense of humour. Very accommodating to all requests. We had Daniel for 2 days. He showed us so much. We had a fabulous time & learned so much about Cape Town & South Africa. TOUR GUIDE RESPONSE: Thanks Curtis. I also really enjoyed it! It was great to show you around. Our tour with Daniel was nothing short of outstanding. His knowledge of the history of the Cape region was amazing and he delivered that knowledge in a light, informative and entertaining style. All four of us concluded that we couldn't have had a more competent and accommodating guide. We all highly recommend Daniel as your guide if you visit Cape Town. TOUR GUIDE RESPONSE: Thanks Bob. It was really a great pleasure to have the four of you as my guests. Daniel was by far and above one of the best tour guides ever. He was prompt, his vehicle was outstanding, he showed us all the things we wanted to see and added some wonderful extras. He was very informative, answered all our questions and was extremely considerate and helpful. We spent a delightful day in Cape Town with a friendly "true gentleman" We thank you all. TOUR GUIDE RESPONSE: Hello Kenda, I don't know how I missed your feedback, but only now noticed it! Thank you very much for the kind words. Two and a half years later - it is time for you to come back!! TOUR GUIDE RESPONSE: Thanks Paul. Really hope I'll see you again! TOUR GUIDE RESPONSE: Thanks Marcella. You were such a fun group which made me want to do everything with you! Daniel was an outstanding guide. He was extraordinarily popular with clients, very good logistical manager, reliable and exceptionally knowledgeable. I will not hesitate to refer him and your company. TOUR GUIDE RESPONSE: Thanks for the very kind words Peter. It was a pleasure to work with Pam and you. TOUR GUIDE RESPONSE: Thank you Gail & Dave. I really appreciate the kind words! Just a pity the clouds wouldn't lift a bit longer for your view on Table Mountain! It's just not possible for a guide to be any better than Daniel. He's smart, knowledgeably, thoughtful, flexible, accommodating, interesting, and very enjoyable to be around. An absolute gem! If only there had been guides half as good as Daniel in other places we've visited, our trips would have been much, much more rewarding, entertaining, and educational. He made our trip to cape Town as good as it could possibly be. We cannot recommend him highly enough. TOUR GUIDE RESPONSE: Thanks for the very kind words Ned.! I am really glad that I could help to make your Cape Town trip rememberable. I thoroughly enjoyed the week with you, and you just showed me how "Old Fossils" (your words, not mine) can enjoy life! What a fun day we had sampling wines at three wineries, shopping in an old general store and seeing the lovely town of Stellenbosch, and having lunch at Hillcrest Berry Orchards! Daniel was an excellent driver and tour guide during the three days we spent with him, and all four of us would highly recommend booking one or more tours with him. TOUR GUIDE RESPONSE: Thanks Andrea, I really appreciate your kind words. We saw all the city highlights and especially enjoyed the Castle, the botanical gardens, and the colorful Bo Kaap area. Daniel took us to Hout Bay so we could get fish and chips for lunch and stopped at a mall for us to go to its food court to pick up dinner. He shared a wealth of information about all the stops. TOUR GUIDE RESPONSE: Thanks for the very kind words Andrea. It was really a pleasure to show you guys around. Daniel adjusted the tour to match the predicted weather conditions, accommodated a member of our group who had limited mobility, and spent much more time with us than we expected. He also stopped at a take-away place so we could get something for our dinner to take back to our B&B. He took us the way we wanted to go down the Cape on the east and back on the west side and stopped wherever we wanted to stop. We saw a gorgeous sunset on Chapman's Peak! TOUR GUIDE RESPONSE: Thanks Andy. I appreciate it. Absolutely wonderful tour. Daniel is extremely knowledgeable about the area, being native born on the Cape. It was a superb day! Daniel tailored the trip in anticipation of any weather changes, exactly as you would expect of a local guide. We circumnavigated the Cape peninsula over the course of the day, taking in the Seal Island off Houk Bay, the penguin colony at Boulders near Fish Hoek as well as the Cape of Good Hope park. The Chapman's Peak road, just reopened, is not to be missed! TOUR GUIDE RESPONSE: Thanks for the kind words Randi. I agree, it turned out to be a great day! Hope you slotted back into "winter mode" okay. My wife, daughter, two friends and I had a superb time on Danie's tour of the local Cape Town area including Table Mountain. We were met as scheduled and rolled along merrily going along the Coast from Camps Bay where we were staying to downtown Cape Town. My wife and I are history buffs and "knew enough to be dangerous" having read two guide books before we arrived. Danie confirmed what we had read, added another perspective, and helped us to clarify what we had questions about. Bottom line- fantastic! TOUR GUIDE RESPONSE: Thanks Ken, nothing dangerous about your Cape Town knowledge - you kept me on my toes! Daniel provided an amazing day out from Cape Town for us. His local knowledge was unbeatable, and his easy and open demeanor made the tour feel like a road trip with an old friend. Thanks for the experience, especially the well-timed whale sighting! TOUR GUIDE RESPONSE: Thanks for the kind words Teresa. You are right, it was an amazing day - I also thoroughly enjoyed it! And as for the well-timed whale sighting- you must believe me when I say I can organize!! TOUR GUIDE RESPONSE: Thanks Kristy. It really turned out a great 3 days after my initial concerns about the weather! I am glad you enjoyed it and hope you are starting to plan your return trip! With Daniel as my guide, I enjoyed a wonderful time in the Cape. He's very prudent, flexible and reliable. For instance, he advised me to reschedule my Table Mountain hiking trip to an earlier day because of the weather forecast, owing to which I could enjoy a beautiful day on the Mountain, while my activities farther away (safari, L'Agulhas, etc) were not affected. I learnt a lot about the history, culture, economy and politics of South Africa thanks to Daniel's elaborate account. Thank you, Daniel. TOUR GUIDE RESPONSE: It was a pleasure Manuel. I am glad I could help you to enjoy your time here! Our Cape Penninsula tour was a great experience. Daniel, our guide, arrived promptly as scheduled and spent the day showing us some of the most spectacular scenary we have ever seen. Daniel accompanied us in all the activities and made sure we had the best vantage points. The vehicle was clean and roomy. Daniel is very accommodating with the agenda and goes the extra mile to ensure you have the best experience. Highly recommended...I'm confident you won't be disappointed. TOUR GUIDE RESPONSE: Thanks Stephen. I appreciate your comments. I can assure you I had just as much fun as you guys! Daniel was a very good guide. Knowledgeable and willing to show us quite a bit of beautiful Cape Town and surrounding area. Good value for the money. nice and informative tour guide. brought us for tasty and not expensive lunch. Daniel is very flexible and we could decide where to go. TOUR GUIDE RESPONSE: Thanks Dove. I would give you and Jenny 5 stars for great tourists if I could!! Daniel is very flexible, accomdating and overall just a nice person. We had a fantastic time and he made us feel very comfortable. We really enjoyed our visit to wine country and our visits to the wineries. Daniel was very knowledgable of Stellenbosch and Franschhoek and showed us a great time. TOUR GUIDE RESPONSE: It was easy to show you a great time, because you were great guests! I hope that you will find time in your retirement to come and visit us again! Daniel did an outstanding job in showing us Cape Town. He was even able to squeeze in a vist to Langa township which was a very memorable experience. Daniel tailors the tours to the client. He shows you what you want to see and does not have a set agenda which we really liked. He is also very flexible. On the Cape Town tour we were to visit the top of table mountain last. Due to high winds the cable car was closed, so he asked if we wanted to go early the next morning before our wine tour. TOUR GUIDE RESPONSE: Thanks David. I really enjoyed showing you and Debbie around. It is amazing how many different things I can see when I saw it through your eyes, and it just helps me to appreciate Cape Town even more! TOUR GUIDE RESPONSE: Thanks Laura. It was great to show you guys around. I am glad you enjoyed it.